“We are absolute beginners,” David Bowie sang in the mid-1980s. Despite decades of experience in life and work, for me this is as true as ever. Every new situation brings its own pulses and heartbeats to the constellation of particular individuals involved, and its own unique story emerges from patterns of circumstance. This certainly makes “responding to change” by honing keen perception and lightening quick (and appropriate!) responses more important than “following a plan.” (1) When the uncertainty leads to anxiety, I try to shift from being anxious to simply being curious about what will happen next. According to Stuart Scott, curiosity and anxiety cannot coexist in the same space. (2) Narrative intelligence recognizes that we are all in the mushy middle of a set of stories yet to be fully revealed. There is art to selecting which moments to claim as beginnings and endings of each chapter, personally and professionally. On an organizational level, I have seen the role of the curious observer contribute positively to adaptive planning and workplace culture. Scott’s essay helped connect dots for the precise mechanism by which this occurs. Simply wondering aloud what might happen next reminds everyone that there are options, and that we can create more. The end is not predetermined. In this fast-moving age, many of the voices capable of conveying such actionable insight are not operating at the center of organizations, but at their peripheries. (3) It may be hard to find them, but try looking in the “interstices,” the spaces where entities, teams, or departments meet and/or mix. Where various organizational peripheries and edges come together, curiosity and fluidity become normative ways to cope with complexity. Curious observers help organizations build up skill and confidence about how to brave uncertainty, negotiate cultural nuances and steer through vast seas of change. Organizations add value when they learn from their edges and embrace the perceptions of those operating at their interstices. As energetic curiosity gets acknowledged more frequently, astute leaders may seek and detect an overall lessening of anxiety across an enterprise. Holding space open to see what will happen next first enlivens us, then emboldens us, and finally enables us to establish the kind of effective connection through which all manner of complexities can be negotiated and explored. What are you most anxious about presently in your work? What is your team most anxious about these days? Can you identify a chapter that’s concluding? Can you invent a more satisfying ending? What new chapter is unfolding? Does your organization hold space open for these kinds of conversations? This is a “found logo” for my business, E. Slomba Arts Interstices. For a couple of months I remained curious about what my logo would look like. 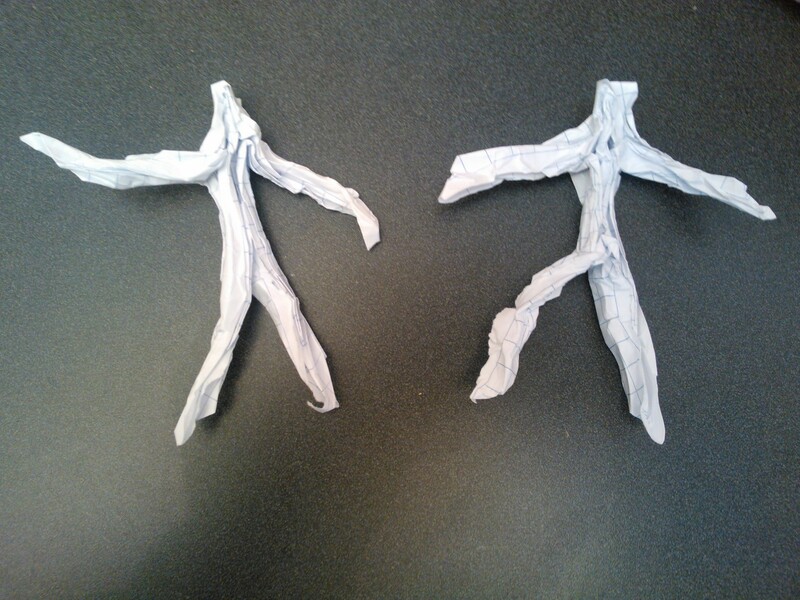 Traveling to Bates Dance Festival in Maine on business, I entered the cafeteria and spotted two pieces of blue-lined notebook paper that someone had crumpled up to look like dancers. That was it! Such lucid recombination of material, sign and signifier grasped my attention and “CLICK!” – the camera on my phone did the rest. Recent publications such as Mario Morino’s Leap of Reason make clear the connections between big thinking, fundability, creativity and survival in the coming years in the nonprofit sector. So in that spirit, here are some questions for arts managers to consider. Have you integrated aspects of project management into your grantwriter’s set of responsibilities? Is your grantwriter considered the “spinmaster” in your organization? Do some of your staff seem resentful of having to “kowtow to funders”? Are grantwriters included in long-range programming and brainstorming meetings? Are programming staff assigned to write portions of your final reports? The arts should stay ahead of this curve – it’s where we belong! Atmosphere: Chairs were arranged in a circle, folk music was playing, and wine, mineral water and snacks were served. History of West Haven Center for the Arts: West Haven is a city of 10 square miles and 56,000 located 5 minutes from downtownNew Haven. In 2003, Paul Scanlon founded a citizens’ arts coalition which collected upwards of 500 signatures in two days for an arts center to be a home for programming. When an appropriate building (formerMasonicTemple) came up for sale in the downtown area, there was a big push with a lot of energy behind it for the City to purchase it. $550,000 in state grant money was approved by Jodi Rell for the original purchase. Asbestos and lead abatement was undertaken by the City with an additional $100,000 raised from citizens, and a $500,000 contribution from Yale. The building is now in a “buttoned up” state, partially renovated and protected from deterioration. In 2007 the West Haven Arts Council became officially incorporated as a not-for-profit, 501( c )(3) organization, absorbing the former citizens’ coalition. Turner Brooks, an architect affiliated with Yale, was selected for the project and brought it through schematic design. At the first Artists Forum, the Arts Council gathered a lot of ideas and input about what the architect was doing. The classical building will have a modern appendage, blending two architectural styles into a unified hybrid. A feasibility study was commissioned which is now available to read in draft form. There will be another design process before construction documents can be created. The Fine Arts Center is committed to solar power and to being a green (LEED-certified?) building. West Haven’s downtown has good bones for parking, traffic flow and pedestrians. The whole city is quite walkable. The fine arts center can create a hub of cultural activity in the downtown area. The Council is “trying not to leave anybody out.” Planning for programming, the question is what are we missing or forgetting? One vulnerability is letting a particular group or discipline monopolize the space. The goal is balance and a mission that will drive the activity forward more than particular personalities. A key word for the center is “flexibility.” The space will be flexible to accommodate a lot of different types of arts and culture programming: galleries, rehearsal space, classrooms, a 2-tier blackbox theater and a 3rd floor wide open space with skylight for interactive events. Grassroots and world-class artists will come together inWest Haven to comprise an entire spectrum of creative inquiry and innovation. West Haven’s Mayor John Picard is extremely supportive. Anew CityCouncil will be seated in the next couple of weeks. State funding for arts is now being channeled via Arts Based Placemaking – tying cultural activity to specific economic drivers that will attract people in their 20s and 30s to live and build innovative industry inConnecticut. West Cove has statewide significance as one of three specialty printmaking shops inConnecticut. Theater West is now in its 4th season and its productions are growing in popularity, attracting 1,200 to the West Haven Green for summer performances. The new train station, the beach and the new fine arts center create three legs forWest Havento stand tall on. At all three places, the other two should have a visual presence to make people aware that all three exist as important and interdependent facets of community pride and growth. Youth programs at the center need to create “a place for outcasts.” Seniors are also important and often underserved. Renting space for performances during recital season could be a good source of income and a community service. West Havenneeds a Greenwich Village-style coffeehouse where live events, information and work-in-progress among artists can be shared with the public. Bring in notables such as the Poet Laureate of Connecticut. Horse-drawn carriages down Campbell Aveserving as shuttle between the beach and dinner theater. Promote the fact that Campbell Aveis exactly halfway between New York Cityand Mohegan Sun – invite buses to stop so people headed for casino can walk around. Let’s become expert at “making something out of nothing.” Take materials out of the waste stream and get them into the hands of creatives. Build upon the partnership with Yale to bring in world-class acts. Drive membership count upwards. There are currently about a dozen members actively involved in projects out of a total membership of about 60 people. President’s goal is to double that in the next few months. April 5th 7-9pm City Hall, West Haven, Meeting Rm A, West Haven Council on the Arts meeting. Meetings are held every first Thursday in the same location. The public can read the feasibility study online at strategicadvisorygroup.com. Password is West Haven.